As someone who grew up in Minnesota, and moved to Phoenix at age 19, the word "soda" sounds very strange to me. Yes, I know it means pop. But it's kinda like hearing someone say "dungarees" (which means bluejeans). And it's a reminder that if you move away from where you grew up, you'll see some strange things, and then after that, you can never really fit in either back home or where you live after that. So I'm not really sure what native Phoenicians call soda. If you grew up in Phoenix, please let me know what you say. I will tend to use the term "soda-pop" as a compromise, and I also used the term in California. 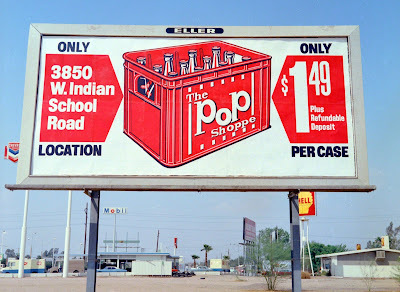 Here in Phoenix I'd be uncomfortable asking someone to go into a store and buy me a pop. Of course in Minneapolis, it wouldn't sound strange at all. I've only lived three places in my life: Minneapolis (where I grew up), Phoenix, and Southern California (Santa Barbara and Los Angeles) so I wouldn't consider myself a world traveler. But I've known a lot of locals in all of those places (people who grew up there, and stayed there) and they can become very belligerent about what things are supposed to be called. I learned to listen carefully, and hesitate, and sometimes ask people what something is called where they grew up. I would only do this with close friends, as this can seem as if you're making fun of someone, which I'm not, I'm just curious. I had a girlfriend from the East Coast who called drinking fountains "bubblers". Really. You East Coast people will back me up on that, right? Can you imagine asking someone in Phoenix or Los Angeles where the bubbler is? I'd say that would be like asking someone for a pop - you might get a pop in the nose! I've lived in Phoenix for so long now that I kind of consider myself a "born again local". But the real locals know that I'm from Minnesota, even if I don't give myself away by saying "Yah, sure, you bet'cha!" And I still can't decide what to call soda pop. I usually just say "Coke or Pepsi, please". 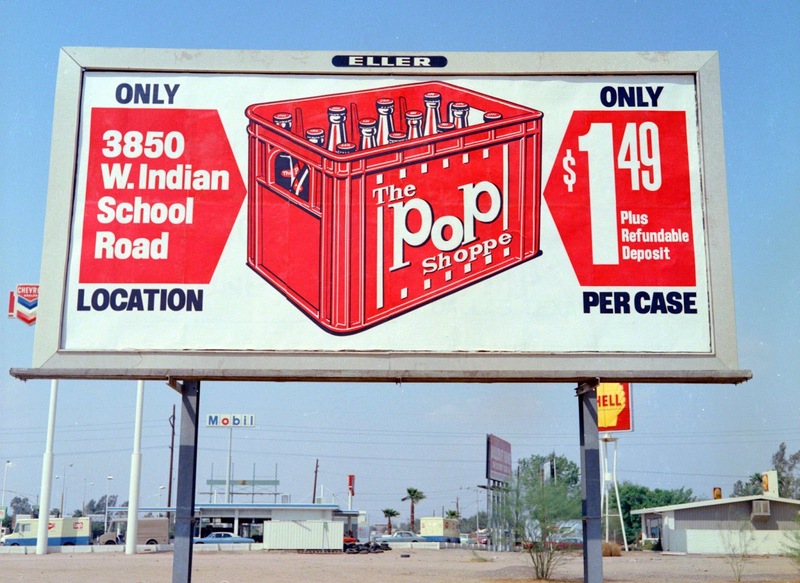 Image at the top of the post: Billboard for the Pop Shoppe in the early 1970s, Phoenix, Arizona. Looks to me like a Midwestern influence. They sold soda pop. Or soft drinks, if you prefer.